Has not fully worked in my possession, just started working on it, the problem is,currently,None of 1,000 point wheels are counting on any player, the 100 points are fine but they are not turning over to 1,000 after 900. Isn't that where the score wheels voltage comes from? The Player Unit stepper in the head routes the power to the reels. It has four positions for the four sets of player reels. There is a 1000 point relay in the head of the game. Is this relay locked on during play? If not, can you activate that relay by hand to activate the 1000 reel to advance? Although it was having the same problem before I bought it too (I bought it that way), so I think there is an extra set inside of the backbox that aren't removed for shipment or something? Either that or I fixed my problem during my cleaning and the jones plug just simulated the issue as well, but I do believe it was the jones plug. Thank you both for your replies, I thought maybe I had a stock targets which also but all of them? I've cleaned and reset and checked the connections and all the Jones plugs, now if the problem is the end of switch, wouldn't it score the thousand before the switch was turned off? If it's dirty that means it's stuck open and always "off"
I would not expect the reel eos switch to be the issue if the reel isn't moving at all. If the 1000 point relay does not lock until you hit a 1000 point target, I also would not expect the issue to be a closed playfield switch. I would start tugging at the wires on the reel switches..you might find one that is loose. Also, make sure the player stepper unit in the head of the has clean rivets and is making precise contact. If you manually advance the player stepper unit to player two, does the 1000 point relay remain locked after 1000 is scored? Bonzo is correct,an End of stroke switch (probably center pop bumper) is either broken or not registering. No, it does this with all players. Except on reset when all of them spin. Located on the relays. I've noticed two problems I guess, The 10 point and the 1K. Point relays stay closed and hum when engaged with voltage still present on their sources. As a opposed to the working 100 Pt relay that I can watch cycle up and down as a target is depressed. Is that the location of the eos? The eos switch is on the reel itself. It is on the top in the animation link labeled "eos." You will need to pull the reel out of the metal frame to see it. The voltage is sent to the reel when a switch on the 1000 point relay closes. The voltage is routed to the reel through the player unit stepper. The eos(end of stroke) switch on the reel cuts the power to the 1000 point relay. Have you checked the switches and wires on the 1000 point relay itself? The manual confirms the ball count until, which is on the bottom board inside the body of the game, also routes though the player stepper unit in the the head. Did you check to see if the ball count until is stepping and resetting freely? Fused changed but ball stepper not engaging. 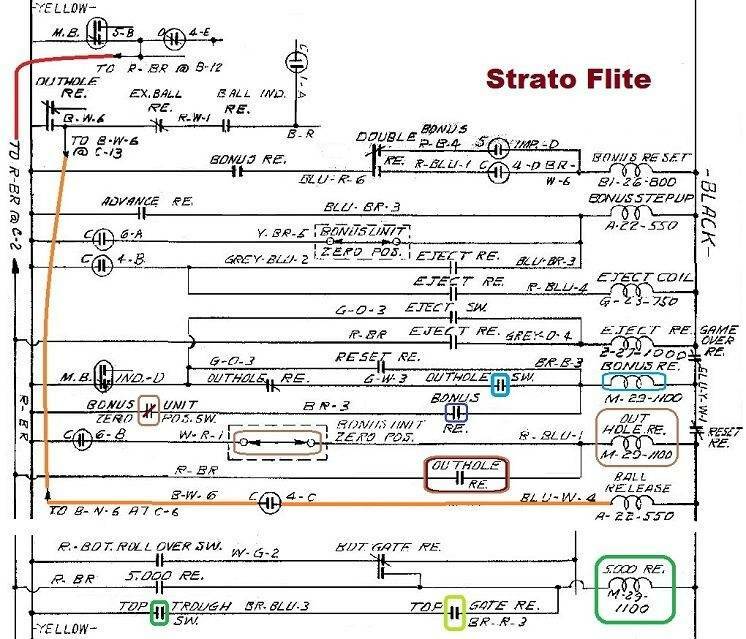 Question: where is the "drain switch" on schematic? A schematics is not an exploded view - the coil of a relay and the switches to it can be shown in completely different (far apart) sections of the schematics. Your post-19 - at end of a ball the ball rolls into the Outhole between the flipperbats and closes the "Outhole-Switch, my encircled light-blue switch" - this makes (and it works in Your pin) the Bonus-Relay pull-in. This Bonus-Relay makes the Bonus-Ladder to step down - the so called Bonus-Unit. The Bonus-Relay has (encircled dark-blue) a Self-Hold-Switch "self-feeding electricity to the coil on the relay". As the Bonus-Unit reaches position-zero the "encircled brown, short red line" Switch opens and the Bonus-Relay quits pulling - question: In YOUR pin ? As the Bonus-Unit reaches position-zero another "encircled brown" switch closes and let current flow to (encircled brown) "Coil on the Outhole-Relay" - the relay pulls-in - establishes "Self-Hold-Current (encircled burgundy-fed-brown) - the Score-Motor is running - through "my orange line" the "Ball Release Coil" fires means the ball is kicked over to the shooter alley. P.S. - here http://www.ipdb.org/showpic.pl?id=2398&picno=31862 in the shooter alley way up --- I believe this switch is for to make 5000 points when the upper gate is open and the ball rolls through the open gate - see bottom of my JPG.